Meet our Herbie of the Week: Mia! Coming from a family of tall, lean genes, Mia never really had to worry about her weight or what she ate. And if she did gain, she would simply try the latest fad diet to shed the extra pounds. Finally, after years of gaining and losing (including the 40lbs from her first pregnancy), Mia decided to go vegetarian and focus on eating healthier rather than a number on the scale. It wasn't until the birth of her second child that the doctor suggested she remove dairy from her diet to help her newborn's persistent reflux -- and that's all it took. 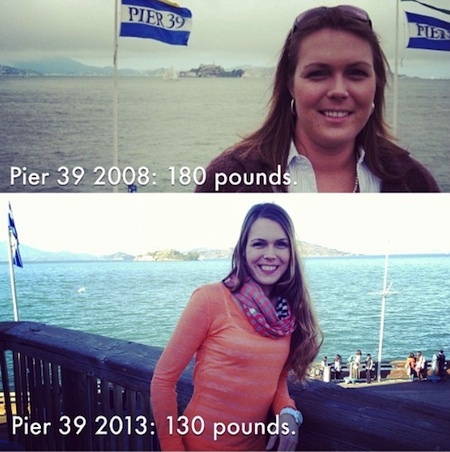 Not long after making the switch, Mia started to experience the many of the wonderful benefits of a plant-based diet. 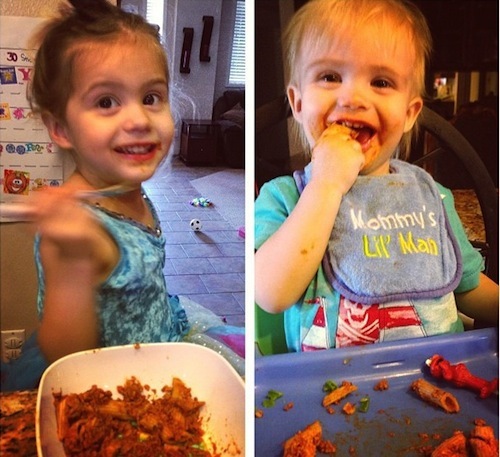 Even her kiddos love eating yummy HH foods (and so do their tummies)! Read on for Mia's beautiful story! 2012 was a year full of change in my life. The best event was the birth of my son, and the second best was my transition to plant-based eating. Although there were several factors that influenced my choice, the discovery of the Happy Herbivore was by far one of the greatest aids in my life change. Finding Lindsay's blog and cookbooks made a seemingly daunting and time consuming task so easy. I originate from the Eastern Panhandle of West Virginia, and I am the granddaughter of a dairy farmer. I grew up around my Dad's livestock and spent several years working on my Uncle's dairy farm. In my early twenties I lived on and helped maintain a farm of 300 or so Angus beef cattle. My mother was very invested in our nutrition, and being one of the oldest in a large family, I learned to cook at a very young age. My mother taught me the basics of omnivore nutrition and took great care in providing well balanced meals for her growing brood. Even though my views on nutrition now contradict many of the nutritional tenants I grew up learning, I admire the commitment my mother made to instilling good eating habits, including the value of a home cooked meal. 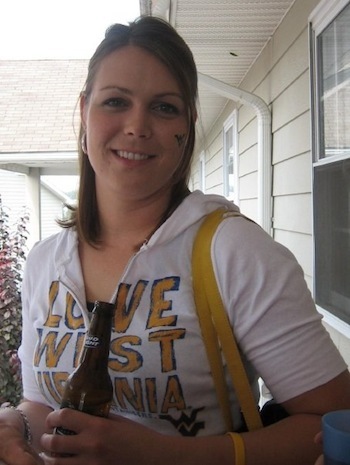 Preparing for a WVU game in Morgantown, WV in September 2008. Weighing in at 180. In addition to coming from an agriculturally based family, I also come from a family of tall, lean genes. As a result I never had much attention on my weight, and never owned a scale until my mid-twenties. In spite of my lanky build of nearly six feet, my weight began progressing alongside my age. In my early twenties I got caught up in a cycle of Diet Coke, Spaghetti-Os, and beer. I work as a Paramedic and have worked 24 hour shifts for a decade. Rotating shifts and sleep deprivation contributed to my lazy eating habits and I started packing on the weight. Interestingly enough, I was mostly unaware of my own weight gain. I recall a few moments in time, though where I was faced with the shocking reality of my increasing weight. The first time I had to buy a pair of double-digit sized jeans I jumped onto the Herbalife craze and dropped 15 pounds. Once that weight was lost, I worked out with little commitment through the PT program that my employer provided. 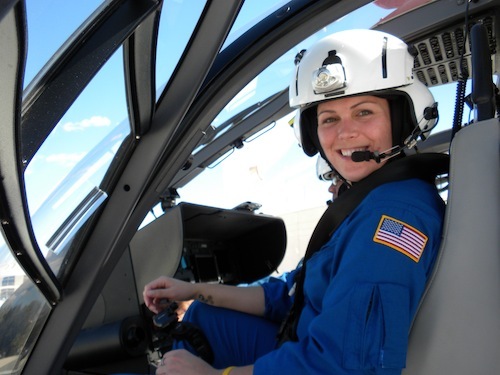 My life long career goal was to be a flight paramedic and I finally landed that dream job in 2008. I was ready for a change in my life so I happily accepted a position with a flight program in California. In preparation I decided to start "eating healthier". The totality of that change consisted of switching to Sprite (because clear soda must be healthier?) and cutting back to light beer. I started walking around the park a few days a week and was satisfied with my weight loss of 5 pounds or so. The final blow was my first day of academy in January 2009. I was on cloud nine -- until they took my weight and measurements. I was the only female in the class and I kid you not, when I stepped on the scale it cracked! Of course I can laugh now, but I was mortified then. Even though I had lost about 8 pounds in preparation for my new job, I weighed in at 172 pounds that day. I was determined to make a change. I was starting a new life and I desperately wanted a new, healthier, thinner me to go with it. I made a great effort to eat healthier, still restricting myself to clear sodas and turkey sandwiches. I found the Flat Belly Diet book and spent my days off work jogging along the shore on Alameda Island and studying work protocols. It paid off too! I worked hard and made my way down to 160 pounds. I was pleased with my progress, but it was short lived. I transferred to Southern California midway through the year and after a year long distance, I was delighted to finally be in the same location as my Significant Other. I found myself in the honeymoon phase. We followed the philosophy "eat, drink, and be merry", and the weight quickly came back. I distinctly remember buying a pair of size 15 jeans that summer, mumbling to myself that the brand must be very confused about their sizes. We had our first child late in the summer of 2010 and I was devastated to peak close to 190 pounds at the close of my pregnancy. I spent the entire year after her birth working to gain control of my weight. Still eating the standard American diet, I put many miles on her jogger stroller and I met my goal of 150 pounds and a size 9 by her first birthday! We celebrated her birthday with the news of our second pregnancy, and while I was thrilled that our girl would have a sibling, I was frustrated at the thought of finding myself close to 200 pounds again. It was also her first birthday that she graduated from breast milk to cow's milk, and that was precisely when she stopped pooping. We battled awful constipation and painful suppositories for months before our pediatrician suggested we drop the dairy from our little girl's diet. Much to our delight, her tiny GI system returned to normal and she was relieved of the painful constipation. 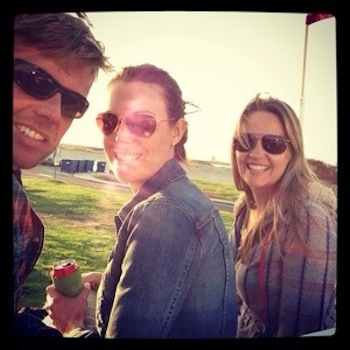 My West Coast besties & motivation for change- Brad and Mary! 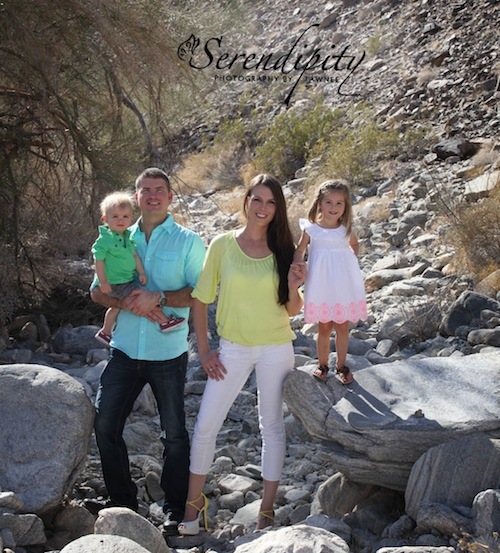 We welcomed our son in the spring of 2012, and I continued my focus on healthy, vegetarian eating. Along with celebrating his birth, we began riding the roller coaster of his persistent reflux. Again, our non-plant-based pediatrician suggested we drop the dairy, but this time it was for me. I had been waiting for an "excuse" to transition, but couldn't convince myself to spend the extra money to buy the almond milk for myself. Sounds like a silly excuse looking back, but we all have our hang ups and reasons for putting off change. Thankfully, omitting the dairy from my diet greatly decreased my newborn's tummy trouble. I was again faced with the the heightened challenge of what to cook. It was right about this time in my journey that I found the Happy Herbivore. I can't recall the exact date, or even the exact source. I am most certain I found her link on the FOK site -- and I must say that discovering the Happy Herbivore was a complete game changer. I purchased the Everyday Happy Herbivore to give it a try, and I fell in love. I couldn't believe I had not found Lindsay sooner! It was so easy! I quickly purchased the first cookbook in her series and pre-ordered Happy Herbivore Abroad. The stress of cooking had completely disappeared. I found myself with a growing passion for cooking, and my interest in nutrition multiplied. My Significant Other was still overwhelmed by the change, he often challenged my dietary change, assuring me that this would just be a fad. His hesitancy only fueled my desire to make this change successful. As my palate began to change, I realized that someone who was still accustomed to high fat, sodium filled meals could find plant-based eating bland. I worked to balance the spices and offer creative solutions to satisfy his tastes. Slowly but surely I saw his view softening. I tend to be an extremist. I have to admit that when I get excited about something, I can become a little overly focused on it. The last year and half has been a learning experience. Balance has been the key to my success. As far as our partnership goes, I had to let go of my need to control his diet and respect his decisions about his food choices. When I started backing off, he started gravitating towards a meat-free diet. I have many of my girlfriends who have expressed the desire to make this healthy change only to receive ridicule and even anger from their spouses. Seeing this has only reminded me that my guy is pretty awesome. We have settled into a nice routine in our home. We eat plant-based at home with his full support. When we dine out, he eats what he chooses -- although as time passes his choices have steered further away from the standard American diet. Our two Tiny Happy Herbies are also thriving on the plant-based diet! Removing the dairy has completely eliminated our daughter's constipation. Our son is now one and since he has never tried dairy, he has never had to suffer through any subsequent GI distress. Raising plant-based kids has been a pleasure for me as I know I am providing them with a healthy start to life. We often get remarks about how crazy it is that our kids love tofu and eat beans by the bowl full. Our omni pediatrician supports our nutrition choices, noting that the kids are happy and thriving. Our daughter, who is now three, helps me flip through the Happy Herbivore cookbooks to pick dinner options. They are currently in preschool. Although I was disappointed to observe the menu choices that the preschools in our town offer, we are fortunate that our preschool supports our nutrition choices. I am able to get a copy of the weekly menu plan, and I highlight the items that I will substitute with a plant-based alternative. This has been a fun challenge for me, and I have relied heavily on the Happy Herbivore to find kid-friendly substitutes in exchange for the extended shelf life food options they serve daily (Happy Herbivore Mac n' Cheese anyone?). I love my Instagram and have enjoyed posting photos of our nutrition journey, particularly all of the Happy Herbivore kid-friendly foods! As for me- I am still getting used to the leaner, healthier me. I've easily maintained my weight close to 130 pounds, wearing a size four. Looking back at myself when I was hovering around 180 pounds, I can now see how run down I was feeling. Even after a year and a half plant-based, I am still not entirely used to being 50 pounds lighter. Going through this life change has brought about more benefits than weight loss though. I have asthma and I also have a congenital cardiac issue, both of which require me to take medication daily. While eating plant-based has not miraculously remedied my cardiovascular complications, it has greatly improved my overall health. My cardiologist remarked that my choice to go plant-based gives me the best chance at protecting my heart from unnecessary damage caused by diet. In many regards,making this change gives me a sense of control over my health that I had not previously known. I cannot change my cardiac anomaly, but I know that with every meal I am strengthening my body and protecting myself from heart disease that would only worsen my existing condition. I jumped right into an exercise training program during my maternity leave, and in spite of the sleep deprivation that accompanies newborns, I found myself with more energy than I had ever experienced before, and less problems with my asthma. Over the first four months of making the change to plant-based I noticed my skin improving (after a lifetime of battling scarring acne), my GI system becoming more comfortable, my energy levels increased, and I was getting so many compliments on my hair! I found that I wasn't focused on weight, I was focused on how great I was feeling! I had a new-found love for cooking. The Happy Herbivore became my best friend as I started cooking my way through each volume. Even now 95% of the meals I fix are Lindsay Nixon's, so my family practically lives off of the Happy Herbivore! Much to my delight I found a lot of people asking about what this whole plant-based thing really is. I was so excited to share my transition and steer many friends in the direction of healthier eating. I have to admit, after gifting over 2 dozen copies of Happy Herbivore cookbooks, I have found my go-to gift! (And with the release of Light & Lean, it was another Happy Herbie Holiday!) One day a girlfriend remarked that I should be blogging about all of my new food experiences, and so the Multifarious Mama was born. Part food, part life -- I found a healthy outlet to share my excitement for plant-based eating. I have found so much satisfaction in writing about my experiences and sharing my nutrition choices with others. Hardly a food blog is published without mention of the Happy Herbivore! Plant-based eating is my healthy choice that has strengthened my overall health and will provide me with many more years of happy, active life. My children are thriving and I am confident that they are establishing healthy habits that can last a lifetime. The Happy Herbivore has played a huge role in making meal time stress free. I cannot imagine this transition with out Lindsay Nixon by my side, inspiring my menus, encouraging my inner minimalist, and truly making my family Happy, Healthy Herbies.